See the whole paper in this 24.5MB pdf file that may take a few moments to download. 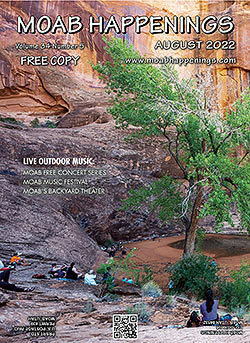 Moab Happenings publication is available at stands throughout Moab and by subscription. Download the festival paper with artists, food, music, kids events and more. This calendar of events contains the most up-to-date and accurate information available at press time. Links to this page for informational purposes are encouraged. Event dates, times and locations are always subject to change. The Moab Happenings calendar of events is provided for the exclusive purpose to assist individuals with their personal plans. Reproduction of this information in electronic or printed form for commercial purposes is expressly prohibited except by written authorization from the publisher of Moab Happenings. All contents of this page are protected by copyright. Apr 24 Daughters of the Utah Pioneers- meet every Wednesday from 2-3pm at the historic building between the City offices & Center St Gym. April 24 Evidence of a large, long-lived lake in the upper Navajo Sandstone by Speaker Josh Smith. Utah Friends of Paleontology Meeting. 6pm, Zions Bank. Free and open to the public. Apr 26 Pop Up Roller Rink! 6-9pm at the Old Spanish Trail Pavilion, 3641 S. Highway 191. FREE for locals on final Fridays of the month! Out-of-towners, just $5 for a skate rental. Disco ball? Check. Dance Music? Check. Classic suede rental skates & roller blades? We've got those too! (Bring your own skates if you got 'em). Skate mate walkers & instruction available. Follow Skate Moab on social media to learn more. This is an all-ages, family-friendly event. Apr 26-28 April Action Car Show- Beautiful vehicles set in the breath-taking location of Swanny City Park, corner of 400 North & 100 West. Don’t miss this fun & unique event. Bring the whole family! No dogs allowFor info: moabcarshow.org. Apr 27 Fourth Saturday Swing Dance! 7-10pm at the Moab Arts & Recreation Center, 111 E. 100 North. Join us for some fun swing dancing! No experience or partner necessary. Beginner lesson at 7 pm. Big Band-era DJ music till 10. $5 suggested donation. More info at facebook.com/moabswingdance. Apr 29 The Unruly Mystic: John Muir - valuing our natural wild places for their transformational qualities, & encouraging everyone to deeply experience nature for its spiritual nourishment, The Unruly Mystic: John Muir Movie explores the remarkable life & influential works of a patron saint of environmental activism & Father of America’s National Parks. The filmmaker, though his own personal journey, entices people to appreciate nature’s beauty & to connect deeper to its abundance. (70 minutes). 7-9pm at Star Hall, 159 E. Center St.
Apr 30 Introduction to Taiko Drumming- learn about the art of Japanese taiko drumming with Moab Taiko Dan. We welcome beginners to join us on Tuesdays 5:30 at the Grand County Middle School band room (door facing the soccer fields). Learn the basics of form & technique of drumming in minutes, while having a ton of fun! For info: moabtaikodan.org. Come drum with us! May 12 Mother's Day Brunch- 9:30am at the Youth Garden Project, 530 S. 400 East. A garden brunch for Mother's Day! This is a family-friendly meal prepared by our culinary inclined staff! Guests are seated throughout the garden or at a long communal table in the garden to enjoy their locally grown meal in the midst of the garden’s beauty. Must call ahead for reservations 435-259-2326. Tickets: Adults-$25, Youth 3-12-$10, 2 & under- Free. Come play in the garden with us! Page numbers refer to the pages in Moab Happenings magazine. It can be downloaded or pick up a paper copy from many businesses in Moab, Salt Lake or Grand Junction.